Over the course of a recording and performing career that spans five decades and over 30 albums, the Nitty Gritty Dirt Band has earned a unique status as one of America's most respected and beloved musical institutions. Since their early days in the vanguard of the '60s country-rock movement, they've consistently drawn from a broad array of influences to make music that's distinctly their own. Along the way, they've scored several hit singles, won countless awards and collaborated with an impressive assortment of contemporaries and legends. rapport that's endeared them to fans around the world. Hanna, Fadden and McEuen were present for the band's formation in the mid-1960s, while Ibbotson came on board in 1969; Carpenter joined up in 1976. Another standout track is the wry “It’s a New Day” (penned by Hanna's wife, renowned singer/songwriter Matraca Berg, and ace tunesmith Tim Krekel) a cautiously optimistic number that taps into the theme of a renewed spirit. 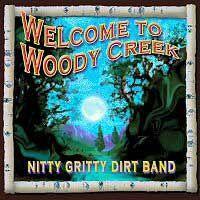 Welcome to Woody Creek also continues the band's longstanding tradition of astute interpretations of outside material, with a haunting, heartfelt reading of Gram Parsons' evocative ballad «She,» as well as a playful bluegrass reworking of The Beatles' «Get Back» that recalls the group's early days. think we avoided that on this one by keeping the original moment of inspiration. success on the country charts with numerous hits including the Number One singles »Long Hard Road (The Sharecropper's Dream),« »Modern Day Romance« and »Fishin' in the Dark.” Meanwhile, the group's trailblazing embrace of its musical roots was echoed increasingly in rock's emerging Americana movement. and airplay aren't as big an issue for us anymore,» Hanna asserts. «Now we're more concerned with just making music that we feel good about and can stand behind,» adds Fadden. «We really consider this album to be the beginning of something for us, and I think that this is how we want to make records for the rest of our career,» Hanna states, adding, «It's a really great time for us. I think that people are hungry to hear real music made by people singing and playing together. That's great for us, because that's what we do."